Sam The Man and The Bath! 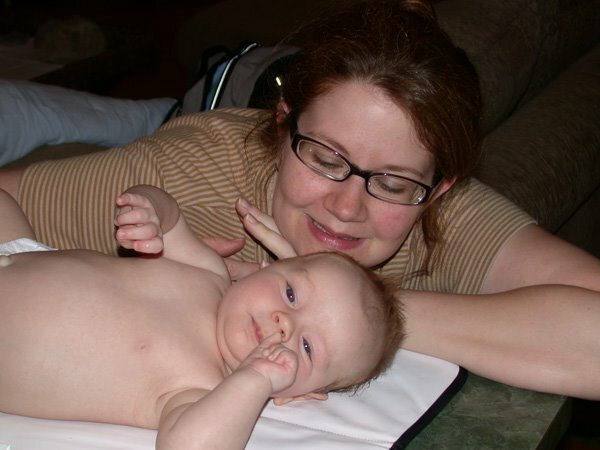 Yes, last week Sam and Sarah visited while Dad Jeff was at a conference. It was time to give our grandson a bath. Mom, Grandpa, and Grandma were ready with all the bathing essentials. Here Mom is getting Sam ready. 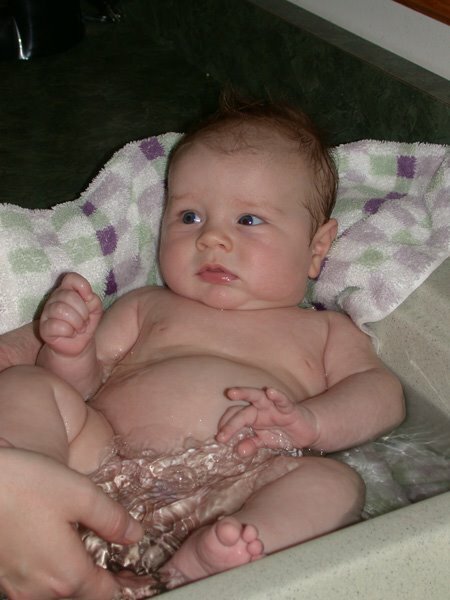 In the photo below, Sam is really enjoying his bathing experience. Notice the joy on his face! The bathtub (which was really the kitchen sink!) was not big enough for his rubber ducky or his computerized sailboat. 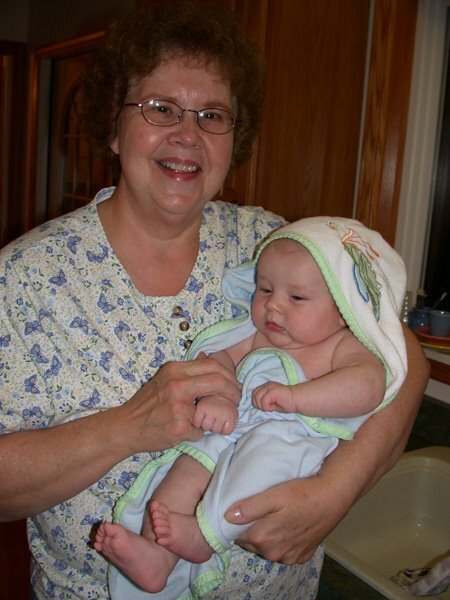 Grandma Meads dries Sam. 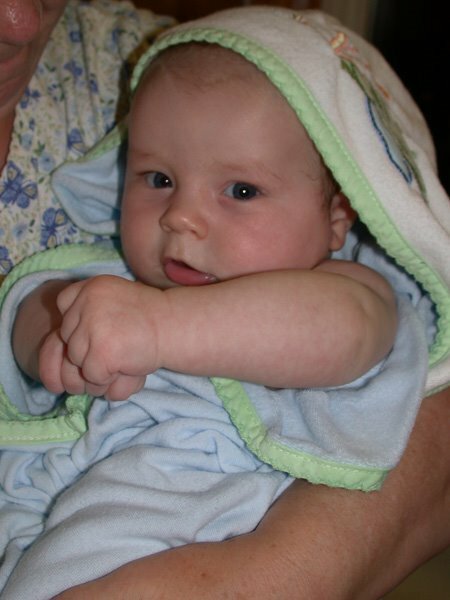 Sam was a litte upset that he had a towel on his head and made him feel uncomfortable since he has seen all the girls wrap their head when washing their hair. Sam has now accepted the idea of the turbin on his head and has great visions of adventures in the Sahara on his favorite camel, Clyde! The bath experience is over and now Sam is clothed in one of Grandpa's favorite outfits. Wonder why that is? This past week Judy and I were in Kanawha, Fayette, and Greenbrier Counties where I did science in-service sessions for the chemistry and middle school science teachers. After we finished on Wednesday in the Kanawha Valley, we headed to Fayette County. We stayed Wednesday evening in a really neat place in Glen Ferris. The Glen Ferris Inn has served guests since 1839 under the previous names of Stockton's Tavern, Stockton’s Inn, and Hawkins Hotel. It may have been built as early as 1815-as there is a 1815 newspaper article that states this-but it clearly has been serving customers since 1839 when Aaron Stockton applied for a license to operate an "ordinary" to accommodate travelers on the James River and Kanawha Turnpike as they passed through the area. The guests who have come to the Inn have included many of the leading personalities of the young country, and include John Tyler, George Rodgers Clark, Henry Clay, John James Audubon, Andrew Jackson, Thomas Hart Benton, John Criffenden, John Breckinridge, Henry Wise, John Floyd, Rutherford B. Hayes, and William McKinley-just to name a few. Henry Clay was such a frequent visitor that the room in which he usually stayed was called the "Clay Room" by the staff and today has been remodeled into the Inn's Conference Room. The wall around the property is very interesting. 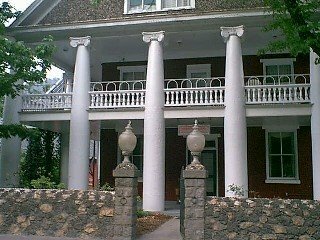 It was constructed in 1910 when Mr. Bonaventura Boisa was hired to do remodeling which also included the addition of the classical columns and porches. The wall is made of local quartzite and large pieces of slag, a waste product from the nearby ferroalloy plant. The rooms are furnished in period pieces and the food is outstanding. When you visit, you have to order their homemade rum raisin ice cream! 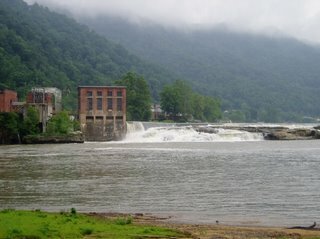 The Inn is located a few yards upstream from the Kanawha Falls. 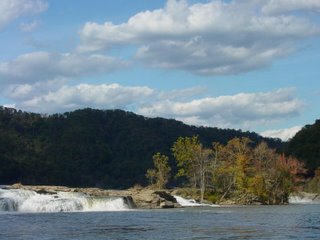 This scenic area has a small park just below the Kanawha Falls. The park is owned by the West Virginia Department of Natural Resources and is a public fishing area. You can see the old hydroelectric power generator in the photo below with the porches of the Glen Ferris Inn to the right. 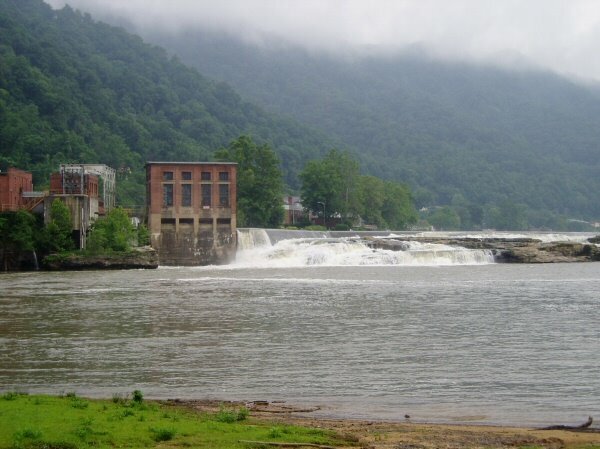 The hydroelectric generator is still in use today. 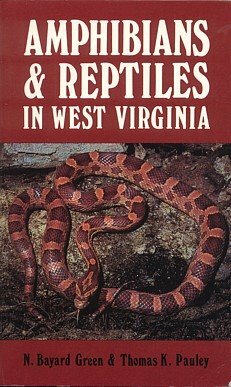 Here is the wonderful WV field guide - mentioned in the last posting- dedicated to the identification of amphibians and reptiles. Tom Pauley has done a super job in the production of this resource. I would highly recommend that you purchase a copy for your nature library. Last Monday, we had the pleasure of attending a garden party at our long time friend’s house in Alum Bridge. Sharon and Dave always are the best of hosts. Sharon’s buffet was wonderful and her flower gardens are always a treat for the eyes. 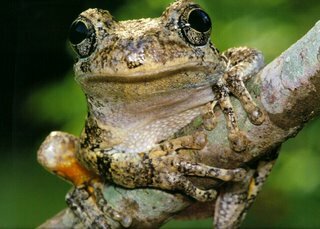 As dusk approached, we were visiting on the front porch when the magnificent calls of the Gray Treefrogs surrounded us. It was obvious that they had a preference for the area around their swimming pool. Needless to say, I was excited! This is the largest West Virginia treefrog even though it is usually under 2 ½ inches in length. The other WV treefrog species are much smaller. The Gray Treefrog has large suction discs on its toes and has a pattern that makes it blend in nicely with its surroundings. I love their large eyes! David was kind enough to provide a light and we were able to observe several of these magnificent critters enjoying their swimming pool. They were busy producing a cacophony of sounds. What a great closure to the garden party! The wonderful short film above is the work of Dr. Jeff Humphries who was a graduate student in Biological Sciences at Marshall University in Huntington, WV. Jeff’s research was directed toward the study of the Eastern Hellbender (Cryptobranchus alleganiensis). Jeff was a graduate student of Dr. Tom Pauley at Marshall. 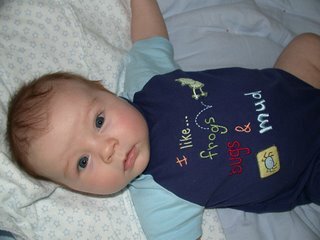 Tom is the expert on West Virginia amphibians and reptiles. When I was teaching Vertebrate Zoology here at Glenville State College, our herpetological bible was N. Bayard Green and Thomas K. Pauley’s field guide entitled “Amphibians and Reptiles in West Virginia”. Herpetology at Marshall began in the 1930's under the direction of Dr. N. Bayard Green. I was Dr. Green’s last graduate student. He retired in 1971. Since then, Dr. Pauley has taken up the leadership of the research focusing on the herps in West Virginia. The Eastern Hellbender is West Virginia’s largest salamander and may attain a length of twenty inches. This primitive looking critter is an aquatic salamander whose characteristics include a large flattened head with small, lidless eyes; a wrinkled fold of skin along each side of the body between the fore and hind limbs; five toes on the hind foot (not to confuse it with the Mudpuppy that has 4 toes on the hind foot); and, large gill slits that lie in front of each forelimb (the Mudpuppy has external gills).